DNA binding is the likely target. 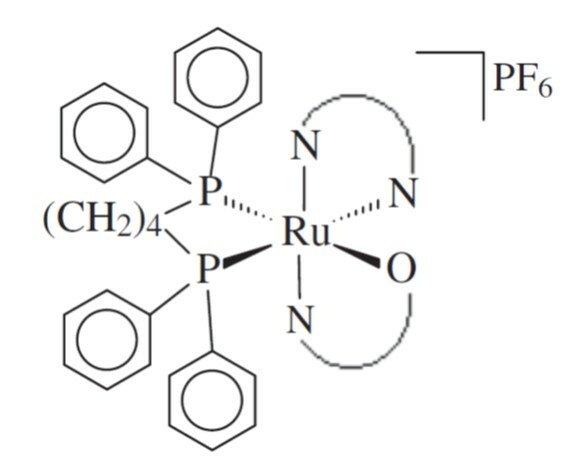 Ruthenium complexes (SCAR) have been tested in our laboratory and showed promising activity against Mycobacterium tuberculosis. These complexes showed up to 150 times higher activity against MTB than its organic molecule without the metal (free ligand), with low cytotoxicity and high selectivity. The in vitro biological results obtained with the SCAR compounds were extremely promising, comparable to or better than those for first-line drugs and drugs in development. Moreover, SCAR 1 and 4, which presented low acute toxicity, were assessed by Ames test, and results demonstrated absence of mutagenicity. Recently we are using the nanotechnology tool to improve the oral bioavailability, stability and controlled release of these compounds.